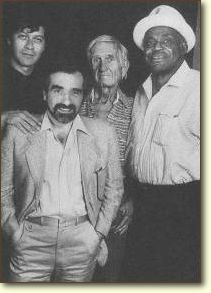 Robbie, Scorsese, Evans and Dixon. Ex-Band songwriter/guitarist Robbie Robertson put together this soundtrack, which allowed him to collaborate with blues master Willie Dixon and jazz master Gil Evans, though it was his collaboration with Eric Clapton that produced the album's hit song, "It's in the Way That You Use It." Also featured: Don Henley, Robert Palmer (three tracks), and B. B. King. 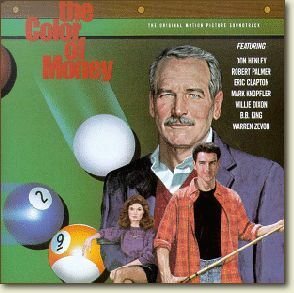 David Geffen, annoyed that Robertson's first solo album was beeing interrupted, refused permission for Robbie's voice to be used on the Color Of Money soundtrack. Instead, Robbie recorded various instrumentals and did what he'd done on The King of Comedy, which was to blend already-recorded songs with special performances. A special deal inked between Touchstone Pictures and MCA Records, enabled Robbie to approach the likes of Eric Clapton, who'd just recorded "Holy Mother", his own tribute to Richard Manuel. In the end, the soundtrack boasted contributions from Clapton, Don Henley, B.B. King, Willie Dixon, Mark Knopfler, Warren Zevon and Robert Palmer, who cut an affecting version of Little Willie John's obscure but brilliant 1963 side "My Baby's In Love With Another Guy". There's an entry for the film in the Internet Movie Database.